Now that Sen. Jeff Sessions, R-Ala. has been named the ranking member of the Senate Judiciary Committee, some on the far-left are gunning for Alabama's junior senator. The battle is happening as President Barack Obama is on the verge of naming an appointee to the Supreme Court to fill void of Justice David Souter.Some of the left-wing points that suggest Sessions has racist tendencies were incorporated into a May 6 Politico story by John Bresnahan and Manu Raju. "By elevating Alabama Sen. Jeff Sessions to their top spot on the Senate Judiciary Committee, Republicans have selected their chief inquisitor for President Barack Obama's first Supreme Court nominee: a Southern, white conservative man who has drawn fire for racially insensitive comments in the past," Bresnahan and Manu Raju wrote. "Democrats like how this is looking." 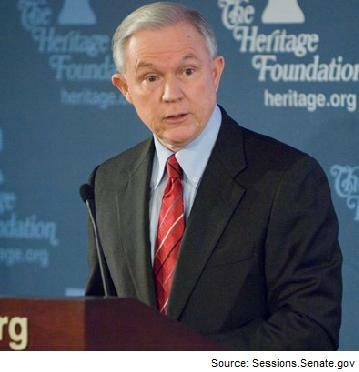 The story sets up Sessions to be on the defensive about race by spinning the senator's own history. According to the Politico story, Sessions had been accused of unfairly targeting black civil rights workers for election fraud charges as a federal prosecutor during a 1986 Senate hearing for a spot on the federal bench. That incident involved an unsuccessful prosecution of three black activists in Perry County, Ala., on voting fraud charges, according to a March 20, 1986 Washington Post story by Howard Kurtz. It ended up being one of the points of contention during the hearing. "I find the Perry County case very, very troublesome." WHO Kennedy said to the Post in 1986, despite telling then-Sen. Jeremiah Denton, R-Ala. in previous conversations "he had no problem" with those prosecutions. However, Perry County, Ala. is still a place notorious for abuse of the voting system. A July 14, 2008, National Public Radio report noted that state and federal officials are still looking into accusations of fraud by government officials, both black and white, for inflating absentee ballot counts. One of the other charges levied against Sessions during his 1986 hearing, which was included in a post by the liberal TalkingPointsMemo blog cited by the Politico story was that he called a black former assistant U.S. Attorney in Alabama named Thomas Figures "boy." "Asked by Sen. Edward Kennedy, D-Mass., whether Sessions had made any other similar remarks, Figures replied, ‘I was regularly called 'boy.'" Later, under questioning by Denton, Figures detailed only one alleged instance when Sessions had called him "boy." Figures refused to detail his charges to reporters after he testified. Assistant U.S. Attorney Edward Vulevich, whom Figures also said had called him "boy," categorically denied the charge, and praised Sessions as "a man of utmost integrity." Justice Department officials produced a document signed by Assistant U.S. Attorney Ginny Granade, whom Figures said may have overheard Sessions call him "boy." "I have never heard Mr. Sessions refer to Mr. Figures as 'boy' or to call him by anything other than his given name," said her statement, issued in Mobile about an hour after Figures made the charge. It's worth noting that Sessions was one of the few Republicans to support Eric Holder's nomination, despite questions about President Bill Clinton's pardon of Marc Rich, as the nation's first African-American attorney general.